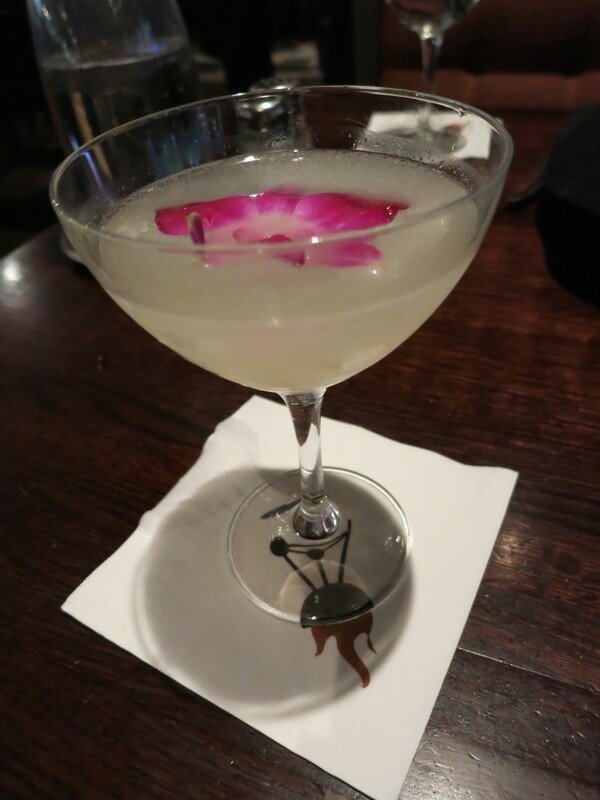 Last week, I was invited as a food blogger to attend a media dinner at Weber Grill. 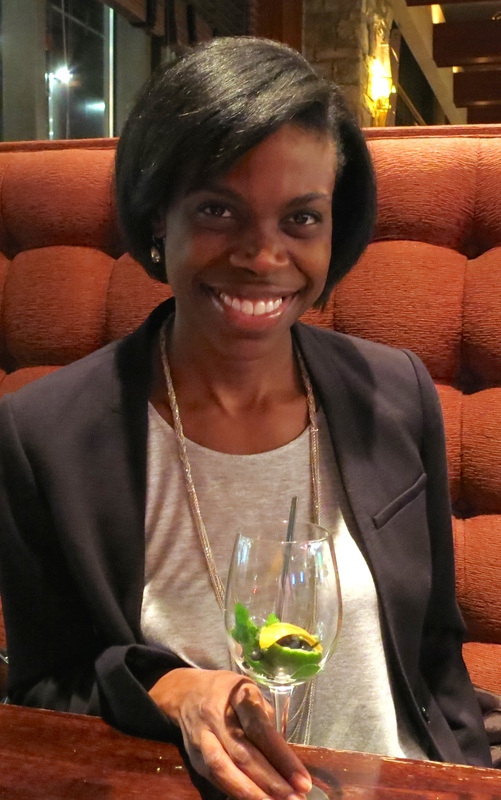 I had never been to the location downtown, so I was excited to visit and see what the refreshed menu had in store. Weber has some refreshing new cocktails, including a classic rum-based daiquiri, which was stirred, not frozen, and there wasn’t a strawberry in sight. It’s a tasty drink, which would be lovely on a nice summer day on the Weber Grill patio. Executive Chef Jason Friedland stopped by my table & mentioned that the Prime Kettle burger started off at Weber as a special item, but it was so popular that they recently decided to make it a regular menu item. 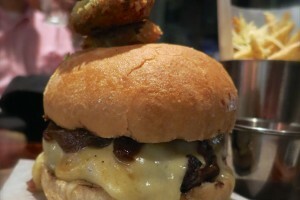 The caramelized bourbon grilled onions are amazing on this burger. The touch of bourbon really makes these onions stand out. Weber Grill’s Kettle Burger with Bourbon Caramelized Onions. YES!! 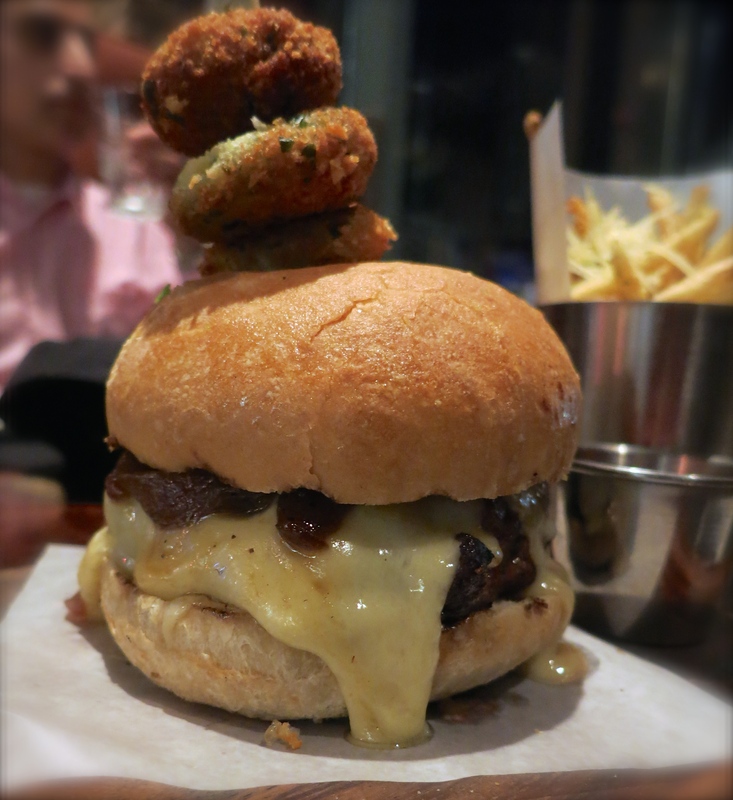 Do you see this cheese dripping off of this burger?? 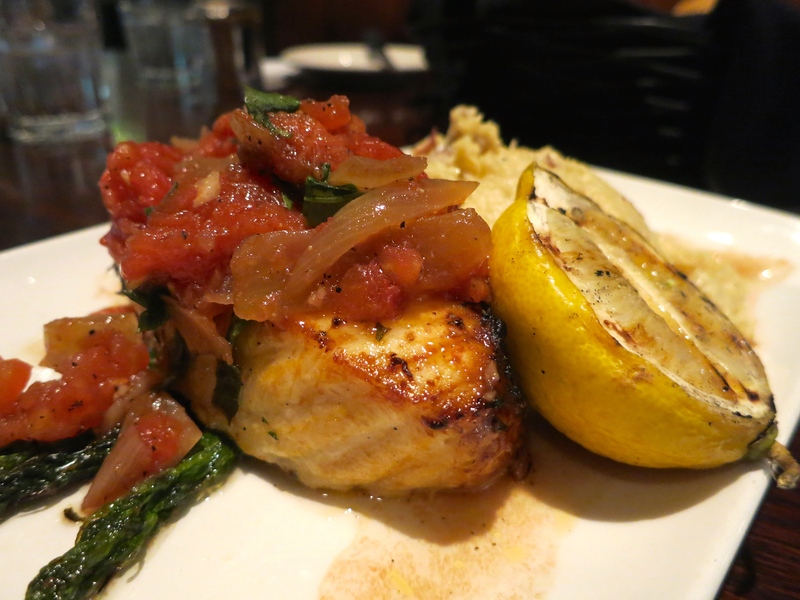 The plank-grilled Chilean Sea Bass is a nice, light option, and as you would expect, Weber really knows how to grill fish. It was prepared just right with roasted cauliflower mashed potatoes, which has a touch of citrus to give it that little somethin’ somethin’. Weber is also introducing some new dessert items that have a cake layer on the bottom, and creamy goodness on the top. My favorite was the chocolate peanut butter. A nice sweet treat to end the meal. 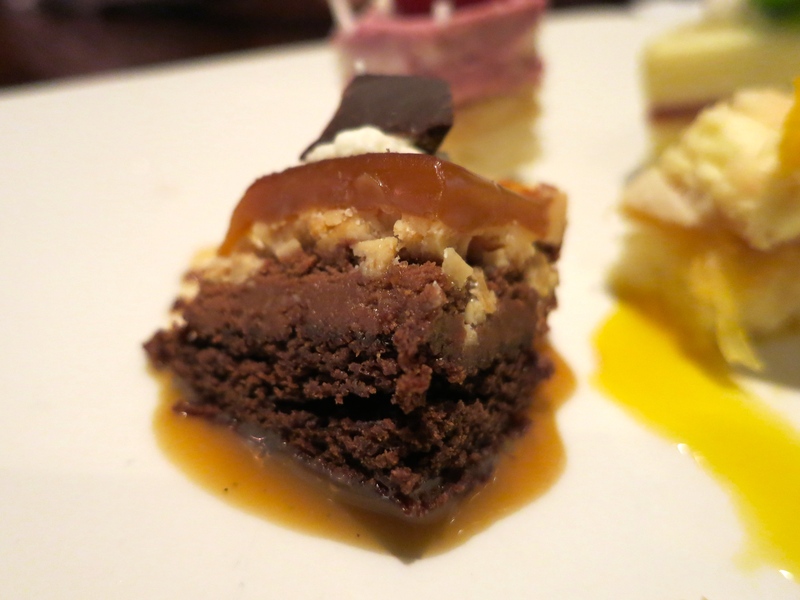 Chocolate peanut butter dessert – my favorite! Weber Grill is a classic Chicago restaurant with good straightforward food – great for foodies and non-foodies alike. I would feel comfortable inviting out of town guests, families with kids, my foodie friends, co-workers, and I would also do carry-out. (I noticed a carry-out station in the front corner of the restaurant). Weber is truly a Chicago gem, and I highly recommend it for a lovely al fresco spring or summer evening. Disclosure: I received this complimentary meal as a part of a media dinner. I was not required to write a positive review, and the opinions I have expressed are my own. Me enjoying my time at Weber Grill! 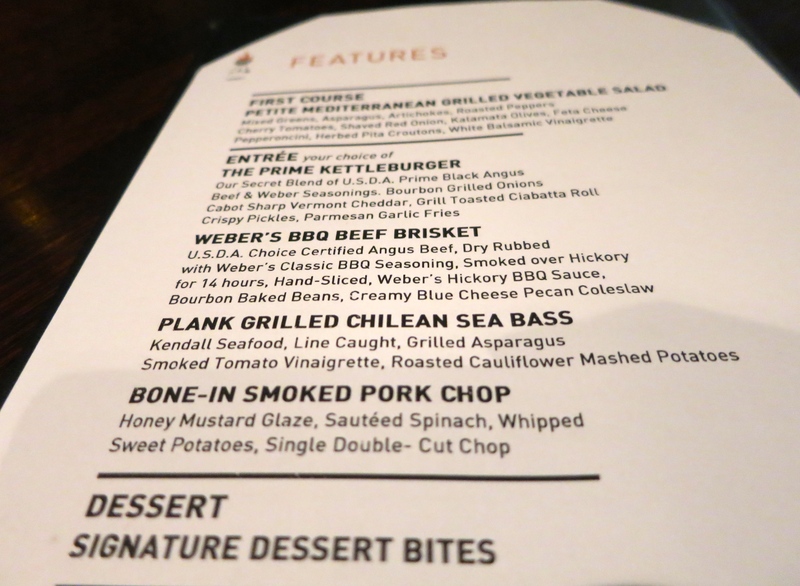 Comments Off on Weber Grill’s Refreshed Spring Menu!